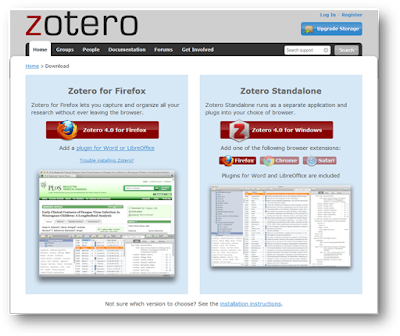 Zotero is free a Firefox add-on as well as a standalone desktop tool that collects, manages, and cites research sources. With Zotero you can attach PDFs, notes and images to your citations, take snapshots of web pages, organise them into collections for different projects, and create bibliographies. In addition you it updates itself automatically periodically to work with new online sources and new bibliographic styles. The tool automatically senses content in your web browser, facilitating a one click process to add items to your personal library. Navigate to www.zotero.org and from the homepage click on the Download Now button (situated top right). - Zotero for Firefox (an add-in to Firefox). Once installed you will see in the top right corner of your Firefox window the Zotero button . Click it to view or hide your library of saved citations. Please note that Zotero continues to run when Firefox is open, whether or not you are viewing your library. References can be added to Zotero either manually, by unique record identifier or directly from online sources. 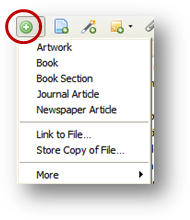 You can manually add items by click on the green plus icon and then selecting the type of reference that you require. From the pop window enter the information in the available metadata fields for your chosen item as necessary. Many documents online have a unique identifier, such as an ISBN for books, a DOI number for journal articles or a PMID number for articles published on PubMed. If you know one of these numbers you can ask Zotero to look for the reference online and import the citation. Click on the add item(s) by Identifier icon, type in the unique number and press enter. Zotero can import from web pages, online library catalogues and databases. As you search, a ‘Save to Zotero’ icon appears in the far right of the address bar. 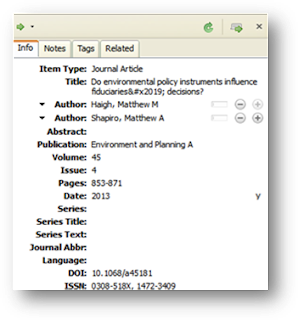 Click on the icon to import the reference to Zotero. The yellow folder allows you to save multiple references from same page, click on the icon and select references from the pop-up window. 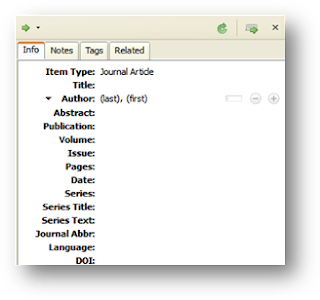 Although Zotero cannot automatically capture citation information from regular web pages, but you can still add them to your Zotero library. 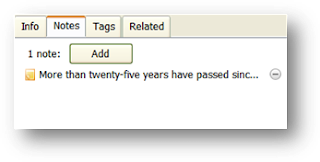 As well as creating a record for the page in your library with basic information about the page and the date of access, Zotero also adds a copy of the page as a snapshot in a sub-document. To view a copy of the page click on the expand icon to see a copy of the page, which includes the page's text and images. This is particularly useful if the page is removed later, or if you are offline, you will still be able to view your copy. With Zotero you store notes in your library, which are synced along with item metadata, searchable, and support HTML formatting. To add a note right-click an item and select Add Note, or add it in the right column under the Notes tab. The Firefox add-in allows you to create notes directly from the webpage you are viewing in Firefox. To do this, first highlight the text you want to copy into a note, right-click and select Zotero in the pop-up menu, then select Create Zotero Item and Note from Selection. This will create a new Web Page item in your library for the visited webpage, with a note containing the selected text. Zotero offers a easy way to collect research papers from the internet, attach PDFs, find relevant articles in your library, and sync it across PCs. Utilising the Microsoft Word/LibreOffice plugin, Zotero takes the stress out of citations and bibliography by doing all the manual work for you. This is a free tool that students must try out!